New Delhi: The Prime Minister Narendra Modi arrives at Vigyan Bhavan to inaugurate the `Urja Sangam`, a summit dedicated to energy, in New Delhi on March 27, 2015. Also seen the Union Minister for Communications and Information Technology Ravi Shankar Prasad, the Union Minister of State for Petroleum and Natural Gas (Independent Charge) Dharmendra Pradhan and the Union Minister of State for Commerce & Industry (Independent Charge) Nirmala Sitharaman. 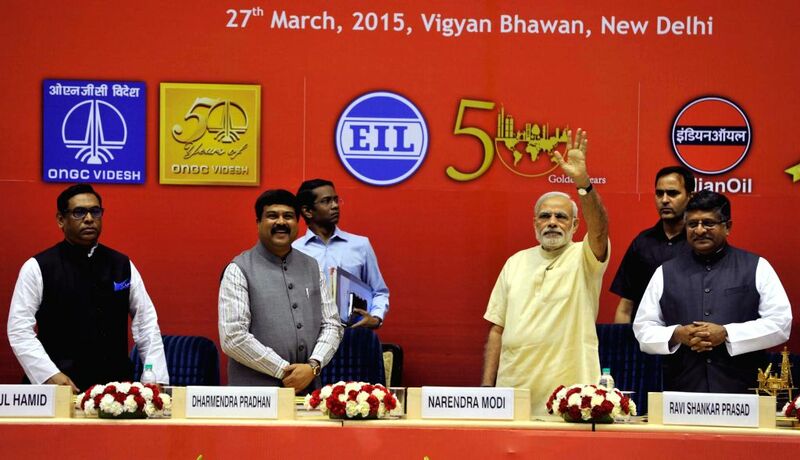 Prime Minister Narendra Modi at the 'Urja Sangam', a summit dedicated to energy, in New Delhi on March 27, 2015. Also seen the Union Minister for Communications and Information Technology Ravi Shankar Prasad and the Union Minister of State for Petroleum and Natural Gas (Independent Charge) Dharmendra Pradhan.